The weather is warming up and the sun is bright, it’s time to get the sunglasses out and dress in your summer gear (not too summery though as it is still only March). I noticed while on a day out on Saturday how the baby wouldn’t keep his hat on, he just kept taking it off and crying because then the sun was in his eyes, so off i went to the shops on Sunday in order to buy him some sunglasses. I found a perfect pair in Decathlon for him. They have elasticated straps that can be adjusted to suit the size of your child’s head, also if the child pulls at them they can be left to hang around their neck and kept in place on their little heads. My eldest two sons already have sunglasses from last year, but as my 9-year-old now thinks he is too old for Transformer style glasses he has asked for some aviator ones, of which i have found in Next. 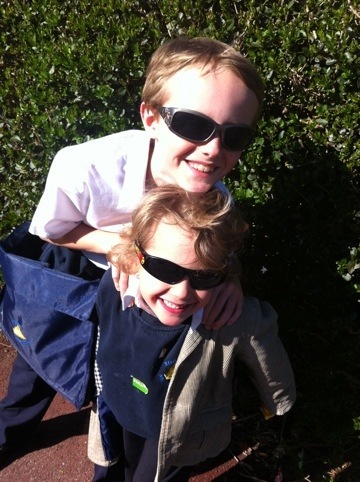 The boys in their Sunglasses. 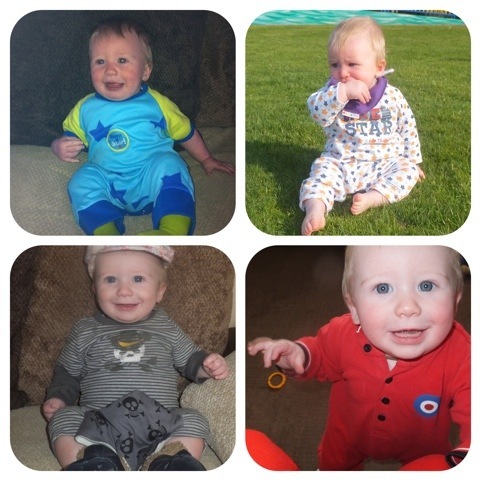 I would also like to tell you all about how i love dressing my baby who is 8 months old in Romper suits. Not only do they look cute and Oliver looks adorable in them but they are great for little ones that are moving around a lot. The fabric has give in them and allows the baby to move at ease, they are comfortable to wear and with press studs underneath it makes it easy access to change their nappies. Romper’s keep the baby looking like a baby but in a grown up way. You can buy Rompers in many different styles, they come short or long leg and the same with the length of the sleeve, which makes them perfect for all year round. Now that it is Spring i have been putting Oliver in his with long legs and sleeves but we do have some summer ones that are of the short style. 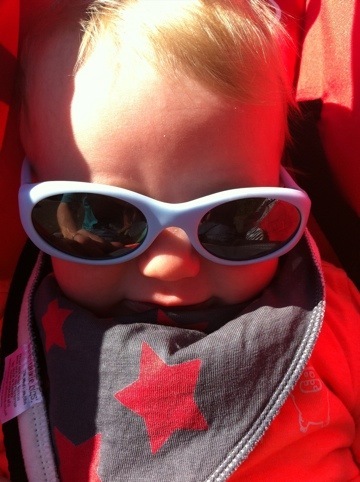 We have many different styles for Oliver that i buy from H&M, Tesco, Ben Sherman and Mamas and Papas. This is my Link up for VeryBusyMama’s Linky Trendy Toddler Tuesday go take a look at what Little M has been sporting this week, he is one cool little toddler and while your there check out some other little trendy toddlers. Previous 86/366 Look down below? What do you see? Funny how they suddenly become aware of things and want to change up their style. I’m not there yet, but I’ve noticed that little m has asked to wear certain things. That’s a first! and the rompers are cute and practical. Thanks for linking, I enjoying seeing their styles!